Glad they spotted your idea! Good things are meant to be shared. I love the contents in the blogs. Thanks for introducing ;-) I am sure that the magazine is interesting as well. Congrats Wendy!! How did you find out that your post was featured in the mag? How exciting! I checked your fruit fly post..how interesting that this method works. Great job and congrats again!! Cool! 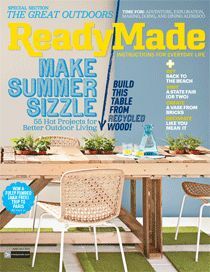 I'll look for a copy of ReadyMade. I'm always ready to feed my magazine addiction. Is that why the fruit flies always head straight for our wine glasses - because they like vinegar? I wonder. Congrats. That is so cool. Blogging is just so cool and you should be pleased...although, fruit flies..I can see that you might have wanted it to be a bit more glamorous. Congratulations to you on the magazine feature. I like your idea too and I'm going to try it out. The site has interesting articles. Hi Wendy Dear, I'm in the [cyber] presence of greatness! Hats off to you. This magazine is unfamiliar to me but looks intriguing. Your inclusion is reason for you to be proud. Fruit fly annihilation via vinegar trap is a wonderful idea and one I will employ this summer for sure. In my kitchen, it's not just the future compost aka veggie/fruit scraps in the sealed bucket under the sink [which by the way, I wait until is completely full before taking out so rest assured you're not alone on this...] but even the fresh fruit from the store or farm or garden that attracts fruit flies. But no more thanks to your genius. You all will really like the magazine.